After receiving the book “Turkish Fire” as a birthday gift, my excitement about the flavours of Turkey was reignited. When we travelled there ten years ago I was in good health. I loved the Turkish food. I loved the way a meal was structured, the flavours and the ingredients but unfortunately for me now, I can no longer eat onions and garlic without uncomfortable repercussions. Along with bourghul, wheat breads and pastries, they are present in quantity in the Turkish daily diet and therefore in the majority of recipes published for the English speaking world. Keen to try making Turkish lamb pizza, I referenced books about sourdough bread and Turkish food to try my hand at making sourdough spelt pide. Yoghurt is traditionally added to Turkish bread dough, sourdough and yoghurt are both fermented so it seemed a feasible transition. I simply replaced some of the water in the dough with whisked natural yoghurt. Inspired by both Greg Malouf’s filling for Lamb and Pine Nut Borek from Turquoise and Sevtap Yuce’s Turkish Lamb Pizza topping from Turkish Fire, I made my lamb filling concentrating on robust spice for flavour. Sevtap Yuce recommends marinating the filling ingredients overnight, and I’m sure this valuable tip helped the warm spicy flavours infuse the lamb. Taking the stuffed pide pies from the oven was a “wow” moment. They were also seriously good to eat. 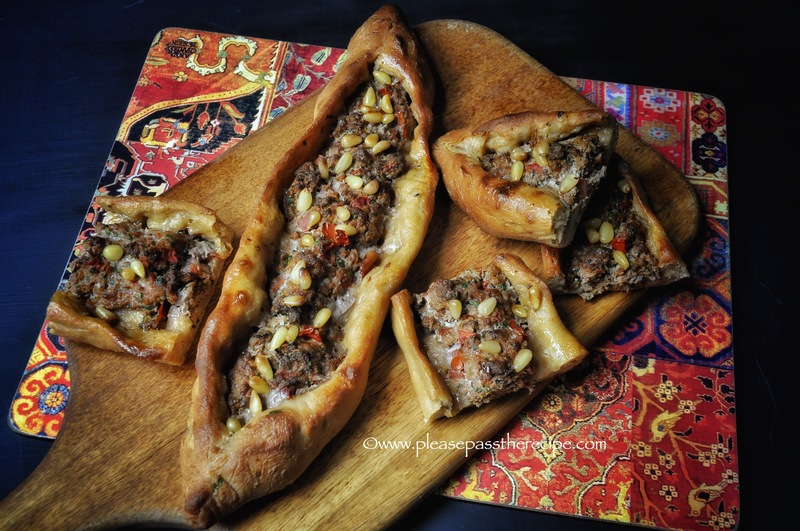 My Turkish lamb stuffed pide pies may not the genuine article, but my modifications made for excellent eating in the Turkish style. Thoroughly combine all the ingredients by kneading together until homogeneous. Refrigerate for at least 2 hours, but best overnight. Measure the starter, flour, and salt into a large bowl. Whisk together the yoghurt water and oil until smooth. Add the wet ingredients to the dry and mix to a shaggy dough, adding a little more water if necessary. Tip the dough onto a bench and knead until it’s smooth and pliable. Clean the mixing bowl, brush the inside with oil, add the dough turning it once to coat, then cover tightly with plastic and set aside until double in bulk. Mine took 3 hours. Preheat the oven to 200C. Line 2 oven trays with baking paper. Gently knock back the dough then divide into 4 equal portions. Shape the dough into balls with a smooth surface and set aside for 10 minutes for the dough to relax.On a floured bench stretch each portion of dough into an oblong 30cm X 18cm. Crumble a portion of meat along the centre of each dough base. Pinch the ends together to create a boat shape. Scatter pine nuts over the lamb. Bake the side pies for 20-25 minutes, until the lamb is cooked and the bread crisp. Remove from the oven, brush the bread with olive oil, then allow to rest for 10 minutes for the meat juices to be reabsorbed. I’m looking for other ways to use my sourdough starter, and to feed us and stock the freezer with DIY “takeaway” simply & cheaply. These pides look lovely is and has given me an idea of how versatile sourdough is. Hi there.iwas wondering if you made some regular recipes but sourdough fermented? I have mild gluten intolerance and aparently fermenting the baked goods reduces it dramatically.please share your experiences with sourdough. Hi Emil, The state of gluten in slowly fermented sourdough bread is the same for any bread made with wheat spelt or rye. The fermentation alters the state of the sugars, not the gluten. If you search my categories file in the right hand sidebar you will find a sourdough tab. The information there may help you make slow fermented sourdough bread. I urge you to be clarify your intolerance before proceding. Some day…someday I will have time to gather ingredients and try so many of your recipes that feature alternatives to ultra fine, over processed bleached white flour. These sound delicious. I loved the Turkish food when we visited there, wonderful spicy savoury flavours. If I had a Turkish restaurant nearby I’d be dining there in a flash. So glad to see your options growing with the spelt sourdough! This looks absolutely delicious. My fam would adore this! What a great autumn meal. Looks delicious. I love the addition of all the spices. The flavour and aroma must must be quite something. G’day Sandra, these pie’s/pizza’s look delish – now some cooler weather is here, its time I fired up the pizza oven & give these a go. I don’t know anything about Turkish cuisine, but this looks and sounds great. No 2nd proofing step before baking? Sandra, that top photo is fabulous. I’m impressed with your spelt sourdough dedication- I can tell you are absolutely loving being able to eat bread again. Well, I may not make the Turkish flatbread but I am seriously impressed by the lamb filling: some terrific flavour notes there . . . think I can use this is a number of ways. Your pies do look beautiful tho’ – shows what one can accomplish to overcome difficulties . . . This entry was posted on March 17, 2016 by ladyredspecs in Baking, bread, FODMAP diet, Food, Lamb, Light Savoury Dishes, Main Meals, Savoury Baking and tagged lamb, low fodmap, pide, pita, pitta, sourdough, sourdough pide, sourdough spelt, Turkish bread, Turkish pizza.